mid nineties at the church. Some people are brought into an appreciation of antique painted furniture by encouragement from a relative or friend who is a collector. Some come to it through self-discovery and research. Some, perhaps most, don’t come to it at all. It depends on how you’re wired. 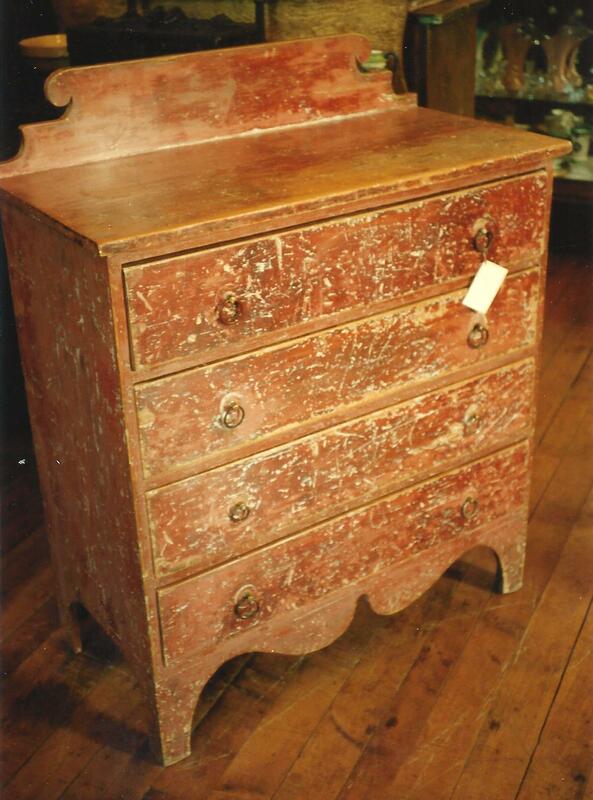 Early antique painted furniture is relatively rare and so you don’t even see it all that often, so many people do not know it even exists. 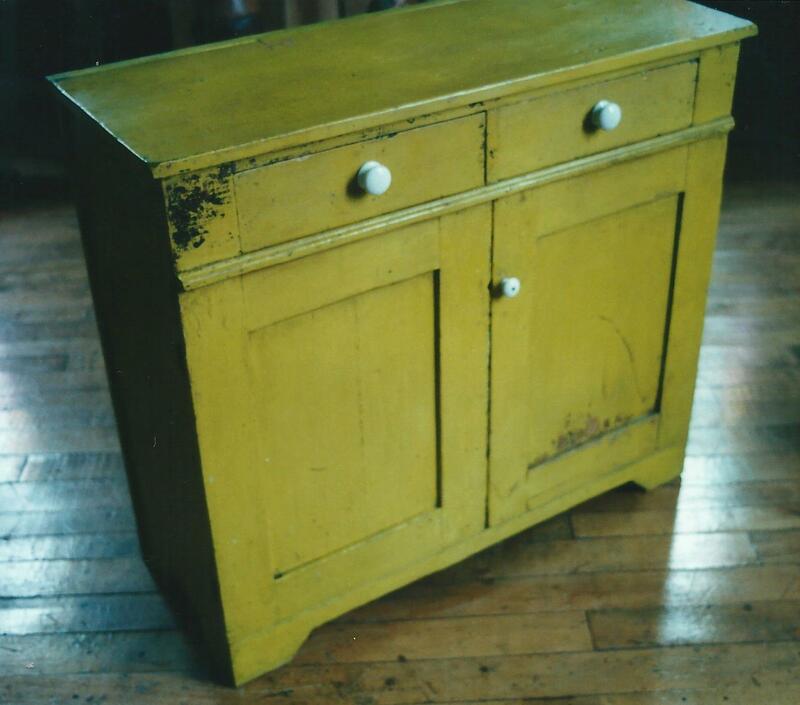 corner washstand in original butter yellow paint over blueberry stain from Thamesville, Ont. In my case, I was brought up in a house with several antiques inherited from my mother’s family. I had a great uncle in Chatham who made furniture so we had a few of his pieces. All either cherry or walnut and all in original varnish. I enjoyed going with my mother and uncle to antique shops and auctions, and occasionally they would buy something. Although these were mostly of the decorating or serving dish variety. My father didn’t seem to care much about the furnishings as long as he had a comfortable chair to sit in and was happy to leave it up to my mother. It wasn’t all about antiques. If we needed a new couch or bed, my parents would buy a new item. 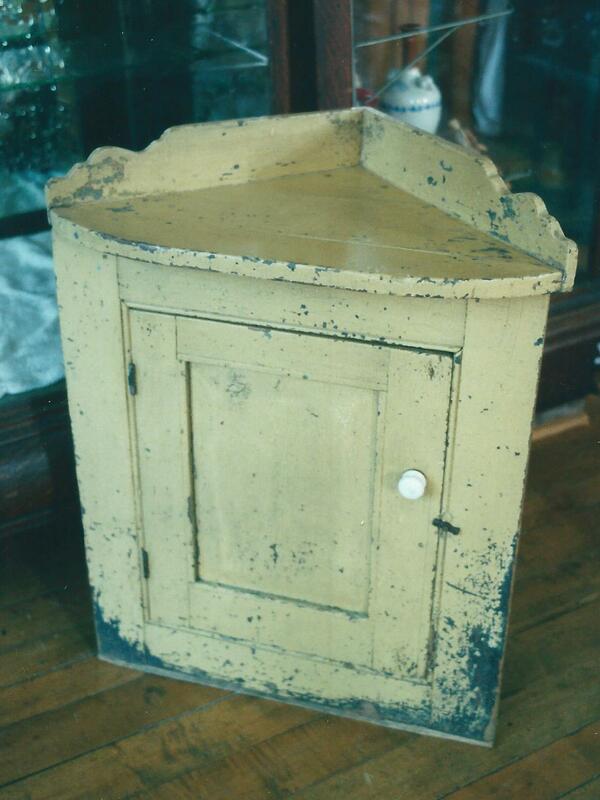 If they needed a chest of drawers they would go for an antique, but they were practical people. Antique beds are 5 1/2 feet long for heaven’s sake, and antique settees are almost universally uncomfortable. I think the reasoning was, if the seat is uncomfortable the guest will leave sooner, and of course nobody was stretching out trying to be comfortable watching t.v. As a teenager I enjoyed the social scene of the rural auction. My tastes ran more towards an appreciation of old advertising, and household objects, but I also had an interest in older hand made furniture. Most of the furniture that I would encounter in those days was either in dark varnish, or faux painted to make a cheaper wood such as maple, look like oak, or overpainted with thick oil paint, most often white or similar trim colour that they had laying around. I’d say an overwhelming percentage was like this, like 80 percent. But occasionally I would see a piece (usually older) in a bright painted colour, darkened, thinned, and untouched over the years. I instinctively gravitated toward these pieces. I didn’t know anything about patina, but I knew they excited me. However, it didn’t take me long to realize that the dealers in the crowd would be right onto these pieces and they would draw big money. I didn’t stand a chance of owning one with my budget. Then when in the early eighties we started to make a living by selling antiques, with a truck and a strong back I began buying lots of antique furniture at local auctions. 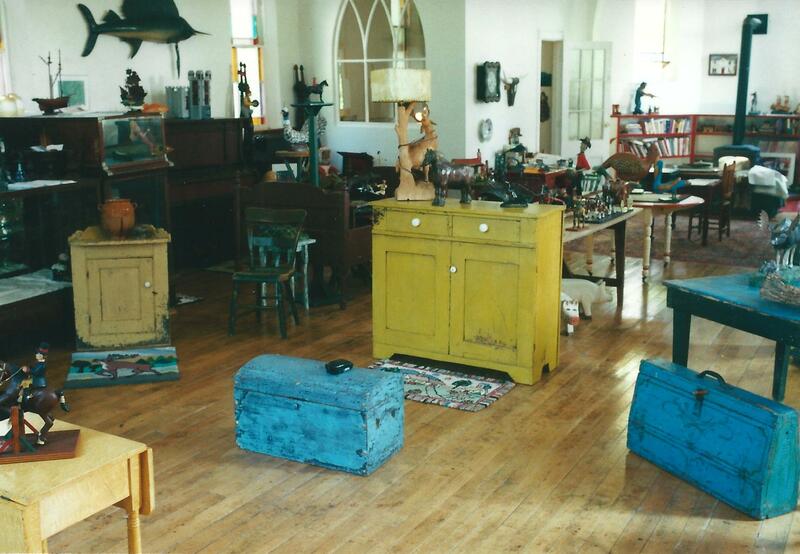 At the time, the biggest part of the market was for stripped furniture in light wood. You could buy a chest with several coats of paint, strip it down to the wood and refinish it, and make a good buck for your trouble. I didn’t mind doing this in ninety nine percent of the cases, but every once in a while I would get a piece which as you stripped it down, would reveal a beautiful colour under all the other layers. Instinctively I would try to save this paint. We used a relatively gentle water-based stripper called PVR, that if your timing was right, would “pop” one layer at a time. It took a bit longer but you had more control and the fumes were not as bad. Well, still bad but I always worked with a big exhaust fan which is why I still have a few brain cells left. I can tell you stories of others, but they are sad, and that’s another day. 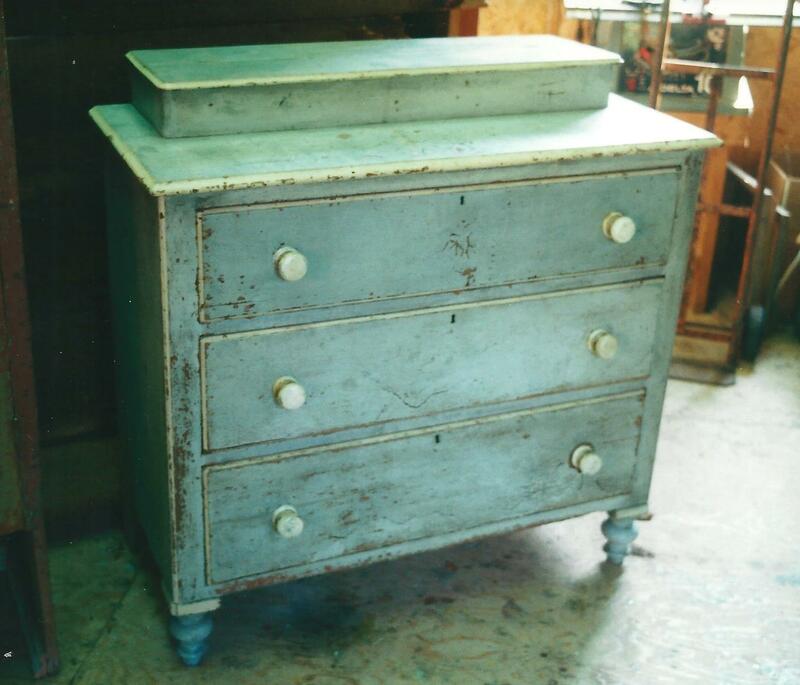 In any case, some of this older furniture, the ones with the beautiful original colours were painted in milk paint. In the days before oil paint. These paints would stay put fairly well stuck to the surface, and if your timing was right you could take all the top layers off to reveal this original paint, and you could stop there and just wash it down with a little Murphy’s oil soap and it would look good. Then later I learned about dry scrapping. I bought myself a good Lee Valley scrapping knife and learned how to control the pressure and retain the concentration to take the top layers off without effecting the original surface. it is a very satisfying feeling when you get this right, and you sit back and admire the finished piece brought back to it’s original glory. Of course, on the rare occasions you will come across a piece that has never been touched, or abused, and is perfectly wonderful the way it is, and with knowledge you realize how precious these pieces really are. Over the years I have developed an appreciation for the ge3nerally finer made, formal “brown” furniture that many love for their city homes, but I have developed a passion for the early country pieces in beautiful colour. Once you have this love of painted furniture there is no turning back. It’s like being in love. Good pieces are not all that easy to come across but they are worth the search. Go to a good Tim Potter auction, or the Cabin Fever show coming up February 3rd and 4th in Kingston, Ontario, or the Bowmanville show on Good Friday and you’ll see some. You might even take something home with you. You’d be wise to. It will enrich your life. 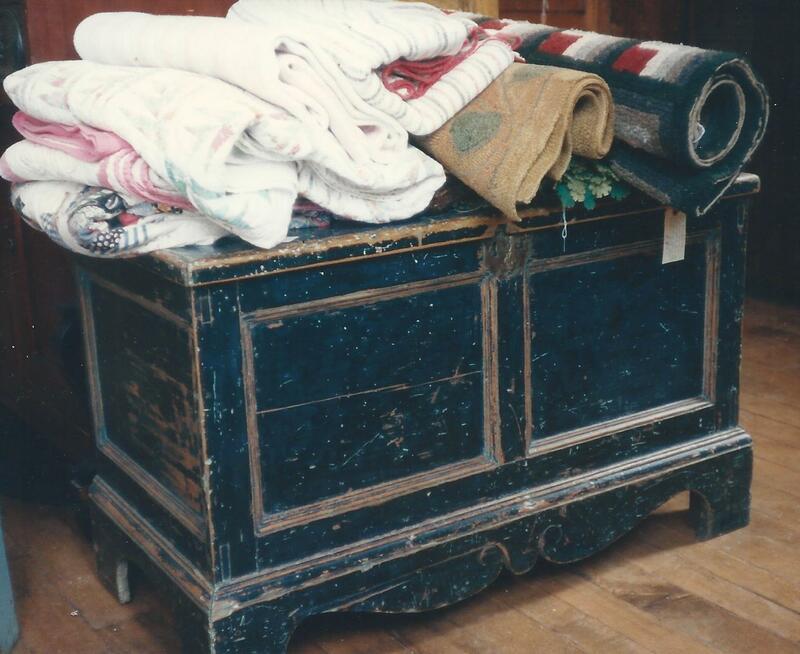 early chest with original, untouched blue and white paint.